A disturbing video has been uncovered online which is geared toward Jehovah’s Witness kids. 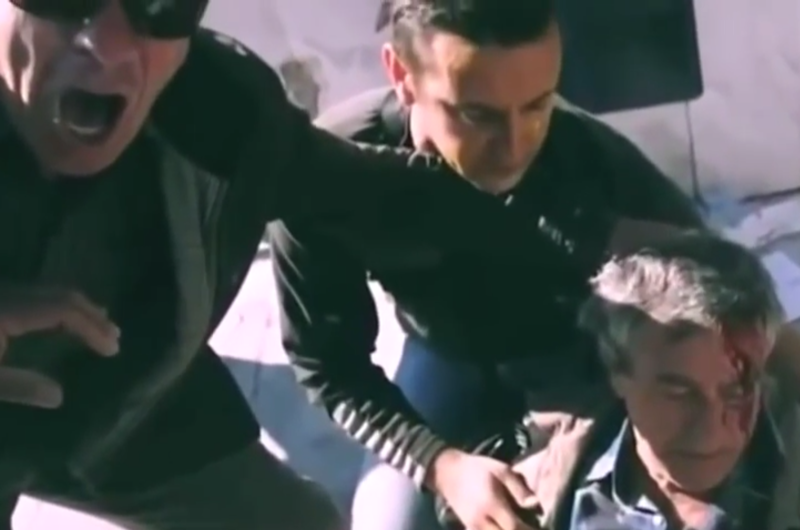 The video, not unlike the gruesome images shown in Watchtower Society’s own literature, depicts images meant to be seen by little children. The ever so popular song, “Life Without End At Last” has been put to video with “kids” in the title. 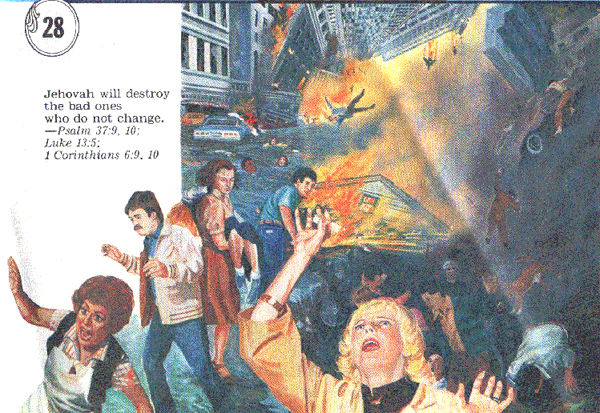 Gruesome and frightening scenes of explosions, war, nuclear bombs, deaths, blood, terrorist bombings, natural disasters and more are being passed before the eyes of little Jehovah’s Witness kids who wish to learn or sing the song. What’s worse is the comments beneath the video which accept the content, clearly aimed at frightening children. 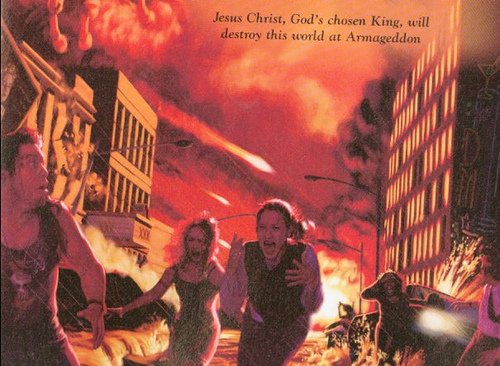 Image of deadly Armageddon shown to small children in Jehovah’s Witnesses Watchtower. The video reminds children that on earth there is nothing but pain and suffering. They cannot be happy until after they’re dead. They may die in a gruesome manner, including drowning in a flood or burning in a fire. They may be subject to genocide and witness bombs going off. Until then, their minds absorb that they must continue living as Jehovah’s Witnesses or they’ll die a tragic fiery death in Armageddon. While Watchtower is sure to include cute animals playing with each other in what is supposed to resemble “paradise”, they have knowingly and purposely placed awful, disgusting fears in the minds of their young ones. Many grow older and anxiety gets worse and worse, unable to get the memories out of their minds. There is no reason for any small child to be subjected to such gruesome doom and destruction at such a young age. Most christian churches offer Sunday schools or childcare for this very purpose, as adult teachings regarding end times may be too much for kids. Jehovah’s Witness kids have no choice. They must sit still, listen, underline and take notes on the destruction that they fear is in store for them if they step out of line. Have a look at the gruesome video that is aimed at Jehovah’s Witness kids. Knowing such a thing will give little children frights, terrors and nightmares, why would Watchtower Society and Jehovah’s Witnesses allow such a thing? The most chilling fact of all is the Watchtower’s teaching that Satan works through paralyzing fears. 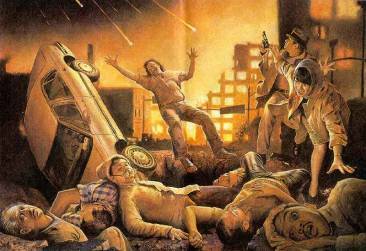 Yet, this is what is put into the minds of Jehovah’s Witnesses. So, while they become more and more frightened, they have been taught that Satan is attacking them once they become fearful. This is sure to put devastation into a child who doesn’t understand why they feel the way they do as their anxiety becomes worse and worse, and fears get out of control. Warning for ExJWs: This trigger may cause disturbing memories and emotional reminders of a painful, scary time in your childhood. Please watch at your own discretion. Parents: Please do not subject your children to a cult. Introduce them to the love of Jesus Christ in a manner which will not cause them psychological damage and horrible anxiety. Visit a Christian church in your area and ask them about their children’s programs which may give them a good, fun, and wholesome way of learning about the bible.